My favorite dining experience above and beyond anything is Victoria and Albert's but it should be. It's a AAA 5-Diamond Award winning restaurant. This is easily then followed by the members-only dining experience at Disneyland, Club 33. Again, this restaurant should take the cake since it is a members-only restaurant (unless you know someone who is a member that will make you a reservation) and it was Walt Disney's vision to have a place to take his friends. Since these two are the most obvious choices and many people can't afford to dine at either location I'm going to discuss my favorite affordable dining experience, Via Napoli. Actually I have several favorites (many signature dining) but I'm going with one that is affordable to most. Via Napoli is located in the Italy Pavilion at Epcot and serves authentic Italian food. When I say authentic, it's something that when touring Italy you will find. This will take you back to your favorite little pizzeria in Italy with it's traditional appetizers, wood-fired pizzas, perfectly cooked pastas and delectable desserts. 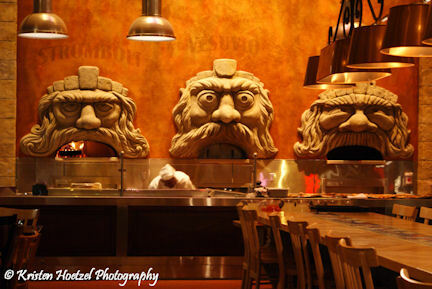 Via Napoli is beautiful with it's rich, warm colors and wood-burning pizza ovens, named after the three active volcanoes - Stromboli, Vesuvius and Etna. All of Via Napoli's wood-fired pizzas are made with caputo flour imported from Southern Italy, San Marzano tomatoes, handmade mozzarella and water from a local spring just like in Italy’s Campania region. A fantastic dining experience! Great food, good service and relaxing atmosphere. The pizza is certainly worth the price for a taste of Italy. 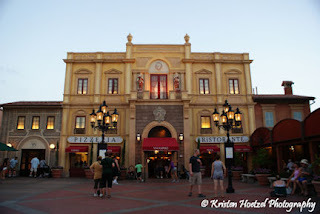 This restaurant is by far my favorite Italian dining experience at Disney. If you've dined at Vian Napoli I'd love to hear your comments. Please share your experience! We have not hit Via Napoli yet, but have been meaning to do so. We just always get sidetracked at the Rose & Crown pub:) And I agree, having dined at V&A and Club 33, both are obviously at the top of my list, but that's exactly where they should be.. I haven't been there yet, Kristen, but your descriptions make me want to try the pizza! We did get over to Biergarten this year, based on your recommendation, and I loved it! I'm sure I will love Via Napoli when I get there also! Thanks! 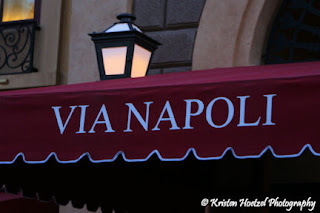 We were lucky enough to get into Via Napoli in June.. the meal was amazing.. My husband and I split a medium pizza - he had meat, I had veggies, plus some arancini to start. We couldn't resist desserts, but I seriously chose wrong - the donuts were not so good. They had close to no flavor and I left the majority of them in the basket - even with dipping sauce. But, I'd still go back - just head somewhere else for dessert! I need to try that place. We lived in Italy when I was 5, and I can still get a taste of the pizza in my mouth every once in awhile. I am so happy that you did this review of it. We have a reservation there in October for the first time and it is the one place that I am most excited about. Great review! I love Via Napoli!! I wrote a review of it and it was glowing. There was a party in my mouth!! 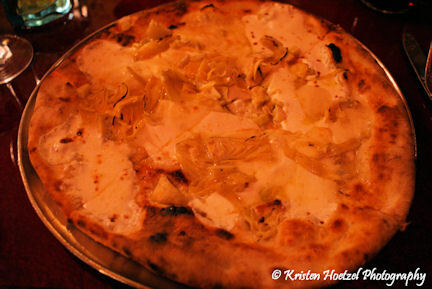 We loved Via Napoli and can't wait to return. This is a very nice review which has provided ideas for our next visit selections. Via Napoli is one of my favorite restaurants! Like Kristen, I too have been to Italy twice. The food is not only authentic but VERY tasty as well. Perhaps one day we will be able to travel there together and have a taste of Italy to savor together! Cannot wait to try Via Napoli. The food sounds amazing. Great post!! I can't wait to try it! I loved being in Italy a few years ago and look forward to comparing it to the "real stuff!"